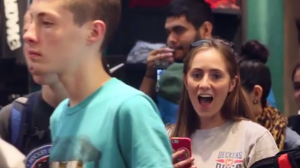 Eric Decker made an appearance at Modell's in Times Square on Saturday May 31, 2014. He signed autographs, took pictures and chatted with all his new Jet's fans! New York Jets wide receiver Eric Decker joins Dave Dameshek on a horse-drawn carriage in New York to discuss draft options for the Jets and New England Patriots quarterback Tom Brady's new hairstyle. Life can be rough. Like when date night is on the same night as the NFL draft. 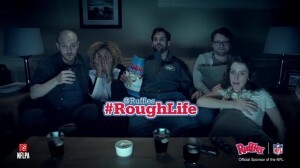 Thankfully, there's Ruffles—and NFL star Eric Decker. Life can be rough. Like when you're having movie night with NFL star Eric Decker, and your chip breaks off in the dip. Eric Decker gives a shoutout to service members and families overseas watching Super Bowl XLVIII on AFN. 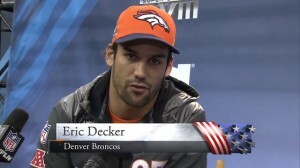 Is Eric Decker Excited for a Girl? The tough guy looks super excited to show off his hair-braiding skills! With friends and family visiting from all over the country, mommy can't help but stress over getting her guests sick. Can Jessie muster the strength to play hostess? Is Eric Ready to Be a Dad? Eric Decker gets emotional while seeing his unborn daughter on an ultrasound on "Eric & Jessie: Game On." Plus, just how big is that baby? The Broncos wide receiver takes an ice bath with teammate Demaryius Thomas on "Eric & Jessie: Game On," but is he man enough to dunk himself?